‘Red Sails in the Sunset’ was written in 1935, music by Hugh Williams and lyrics by Jimmy Kennedy. Jimmy Kennedy was born in Omagh, and most of his early life was spent in Omagh, Coagh and Newtownstewart. When Jimmy Kennedy's father retired from the RIC, he built a house in Strand Road, Portstewart, and it was while visiting his father that Red Sails in the Sunset was conceived. Kennedy wrote some 2000 songs, over 200 of which became worldwide hits. Many of his songs were recorded by such diverse artists as Bing Crosby, Dean Martin, Vera Lynn, Perry Como, Fats Domino, Louis Armstrong, Nat King Cole, Larry Adler, and Russ Conway. The lyrics were inspired by watching a small yacht (Kitty of Coleraine), sailing westward into the setting sun off Portstewart Strand. There is a 10 foot tall fishing boat sculpture on the Portstewart promenade to commemorate the song. In ‘Red Sails at Sunset’, the notes of the chorus of the song slowly evolve over a nocturne like accompaniment. The central section is an atmospheric evocation of the boat at sea. 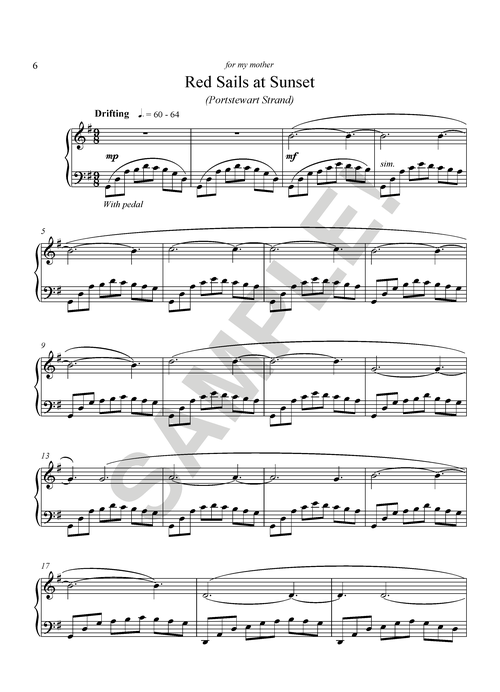 The piece closes with the notes of the chorus played in retrograde. I chose this contemplative subject, partly because Portstewart Strand is one of my favourite places along the North Coast, but also as a homage to Jimmy Kennedy, who is a distant relative of mine. 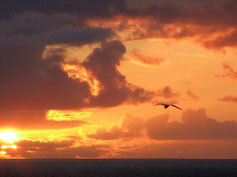 The sails in the beautiful photograph of a North Coast sunset by David Penpraze are the wings of a gull.